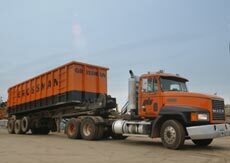 Grossman's sophisticated equipment enables our customers to get the most value out of their scrap. No other company in the region has invested in such a wide range of equipment. It's the best in the business. Our scrap experts will work with you to determine the type, size, and quantity of equipment that best meets your scrap needs and fits your location's parameters. Grossman's trailers and containers are safe, clean, and bright. We're meticulous about maintaining a professional image at your site.